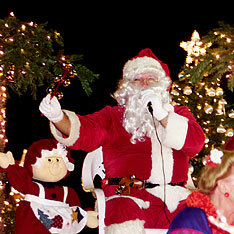 The city's annual Electric Light Parade is scheduled for Saturday at 6 p.m. The parade features city vehicles adorned with lights and decorations and will begin at King and River streets, then pass through Chinatown and downtown. Police and fire vehicles, an ambulance, TheBus and Handi-Van will be among the vehicles in the parade. Afterward, city vehicles will be displayed on King Street between the Kapiolani Boulevard and Punchbowl intersections until 8 p.m. The Ko'olaupoko Hawaiian Civic Club's annual scholarship luau, a fundraising event, is set for 4 to 8 p.m. Saturday at Pu'ohala Elementary School in Kaneohe. The traditional Hawaiian-style luau will include 13 menu items, including kalua pig, squid luau, lomi salmon, chicken longrice, raw fish and many other fixings, said luau chairman Clarence Kelley. The event includes a silent auction with Hawaiian wreaths and other handcrafts. This year's theme is "Ho 'ikahi ka 'ilau like ana ... working together." Takeout orders will be allowed between 4 and 6 p.m., the club said in a news release. The luau also will be a collection site for donations of nonperishable food items and toiletries to be distributed in kokua baskets during the holidays to low-income families in the Ko'olaupoko area. For tickets or reservations, contact Kelley at 239-9504 or georgimaile@aol.com. Donations are also welcome. A new telephone hotline offers information about current water quality warnings at Hawaii beaches, the state Department of Health announced this week. Callers to 586-5826 hear a recorded message about any state-monitored beaches that have water quality problems. Last night the message said there were no current water quality warnings. Information on water quality can also be accessed at the department's Clean Water Branch Web site at www.hawaii.gov/health by clicking on "Contaminated Water Warnings," according to a press release. "With the holidays coming up, we know people are doing to want to know about swimming at the beaches. This hotline is our effort to help provide the public with timely information," said Larry Lau, state deputy director for environmental health. Medical doctor Stephen B. Wilson was sentenced Tuesday to 18 months in prison for federal income tax evasion by Chief U.S. District Judge Helen Gillmor, a U.S. Department of Justice news release said. Wilson pleaded guilty on July 14 to tax evasion in 1998 after being charged in a two-count indictment with federal income tax evasion in 1998 and 1999. Wilson admitted to reporting his 1998 income as $46,915 with a tax due of $9,840, when his income that year was $376,969 with a tax of $138,552 owed, said Edward Kubo Jr., U.S. attorney for Hawaii. Wilson currently owes $277,000 in federal, state and general excise taxes, according to the Justice Department. The manager of the Hilo Public Library has been named the 2006 Public Librarian of the Year for the state library system. Claudine Fujii was selected by The Friends of the Library of Hawaii. Fujii, who became head of the Hilo Public Library in February 2005, will receive her award at a ceremony at the Hawaii State Library from 6 to 8 p.m. on Thursday. Hilo Public Library will receive $1,000 from Borders Books & Music, sponsors of the award program. The Friends of the Library of Hawaii will present the library with $500. Also at the ceremony, three members of the state's public library system will receive the Excellence in Service Award for 2006: Melissa Jordan of Kapolei Public Library, Jennifer Relacion of Princeville Public Library and Sheri Akuna of the Makawao Public Library. Each will receive a check for $500 for her library branch. Hawaii County Fire Department rescue crews pulled the body of a 19-year-old California man from the ocean early yesterday morning south of Hilo, the department reported. The man and a 22-year-old woman were both swept into the ocean Friday morning by high surf, but the woman was rescued Friday and taken to Hilo Medical Center for observation. The man's body was reported at 6:07 a.m. yesterday and recovered by rescue workers using a helicopter with a rescue basket, Fire Department incident commander Ty Medeiros said. Police and fire officials were not releasing the name of the man yesterday. Medeiros said Friday that the woman is the girlfriend of the man's brother. Two men and a woman were arrested for allegedly threatening to kill a 56-year-old woman in Honolulu, police said. The victim was confronted by the three after she attempted to pass by their vehicle, according to a police report. A 27-year-old man with a knife grabbed her hair and threatened to kill her and her dog, police said. A 21-year-old woman made similar threats, and a 33-year-old man pushed her while she was trying to leave the area, according to police, who did not give the location of the incident. Police arrived and arrested the three suspects on suspicion of kidnapping, first- and second-degree terroristic threatening and harassment. Two men were arrested early yesterday for allegedly shoplifting at the Sears Pearlridge store. According to police, store security guards said two men, ages 38 and 26, were seen filling two shopping carts with merchandise late Friday night and pushing them out of the store, passing open registers without paying for the items. The suspects were stopped and detained for police, who arrived early yesterday morning and arrested the suspects.